Share your best Team Transport Truck Pic for your chance to WIN ! “Truckin Good Aussie Treats” and $100 Bunnings Voucher! The promoter is Team Transport & Logistics of QLD, ABN 16334296903, 28-32 Antimony Street Carole Park Qld 4300, Ph 1300 138 326. The promotion commences at 3.00pm (AEST) on Friday 1st July, 2016 and closes at 12.00pm (AEST) on 31st August, 2016 (amended). Entry is open to all permanent residents of Australia. Only entries submitted via the Instagram application and which are appropriately hashtagged will be accepted. Photographs submitted must be original works. Judging will take place at Team Transport & Logistics, QLD on Wednesday 31st August, 2016 at 3pm (AEST). If the winner is under the age of 18 years, the prize will be awarded to their parent or legal guardian. The competition is a game of skill and chance plays no part in the selection of the winner. Submissions will be judged by Kylie Wilkinson and Bianca Skinner, (the promoters judges) according to the following criteria: The relevance of the submitted photo to the theme in question, as decided by our judges. Entries that are deemed to not belong to or be taken by the user will not be eligible. The promoter reserves the right to verify the validity of entries and to disqualify any entry which, in the opinion of promoter, includes objectionable content, profanity, potentially insulting, inflammatory or defamatory statements, disqualify any entrant who tampers with the entry process, who submits an entry that is not in accordance with these terms and conditions of entry or who has, in the opinion of promoter, engaged in conduct in entering the promotion which is dangerous, fraudulent, misleading, deceptive or generally damaging to the public or reputation of the promotion and/or promoter. The promoter reserves the right to disqualify a winner if the promoter becomes aware that the winner and/or the winner’s entry is of a type described in this clause. 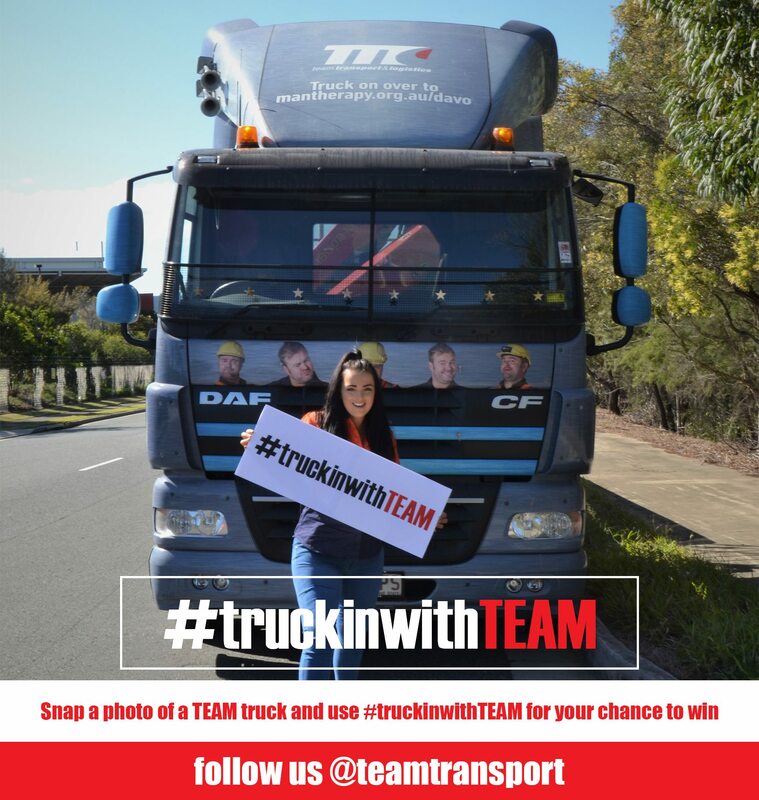 Use of images: All images published on Instagram with #truckinwithTEAM may be moderated and displayed on the website and social media channels of Team Transport & Logistics. These images and associated usernames will be public to all. Use of personal information: By entering the competition and accepting the terms and conditions, you agree that Team Transport & Logistics may use your personal details for the purpose of conducting the competition, including the use of your Instagram name in promotional formats. By entering the competition, you give Team Transport & Logistics permission to contact you via Instagram if you are a winner of the competition for the purpose of distributing your prize to you. The promoter shall endeavour to contact the winners via their Instagram account within one week of the results. In the event that the winner/s cannot be contacted after one month, an alternate winner/s will be selected and the original winner/s will forfeit any prize. This promotion is in no way sponsored, endorsed or administered by, or associated with, Instagram. Participation in this competition assumes the acceptance of the Instagram terms and conditions, found at http://instagram.com/legal/terms/9.